MITCHELL, Arthur Wergs, a Representative from Illinois; born on a farm near Lafayette, Chambers County, Ala., December 22, 1883; attended the public schools, Tuskegee Institute at Tuskegee, Ala., Columbia University, New York City, and Harvard University; taught in the rural schools of Alabama for many years; founder and president of the Armstrong Agricultural School, West Butler, Ala.; studied law; was admitted to the bar in 1927 and commenced practice in Washington, D.C.; moved to Chicago in 1929 and continued the practice of law; also engaged in the real estate business; alternate delegate to the Democratic National Convention in 1936 and delegate at large in 1940; elected as a Democrat to the Seventy-fourth and to the three succeeding Congresses (January 3, 1935-January 3, 1943); was not a candidate for renomination in 1942; resumed the practice of law; also engaged in civil rights work, public lecturing, and farming near Petersburg, Va.; died at his home near Petersburg, Dinwiddie County, Va., May 9, 1968; interment on his estate, Land of a Thousand Roses, in Dinwiddie County. Dennis S. Nordin. 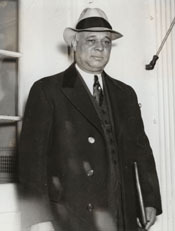 The New Deals Black Congressman: A Life of Arthur Wergs Mitchell. Columbia: University of Missouri Press, 1997.